Almost everyone is familiar with a Search Bar. Whether you're using Google, Bing, or just browsing some random website, you always use this to filter out results using a keyword (or a search query). Using John Smith, an IP address, or Yes as your search keyword would fulfill the search queries above. So, how can you do this exactly? Simple - Just go to the Submissions Page and scroll all the way down to the bottom. 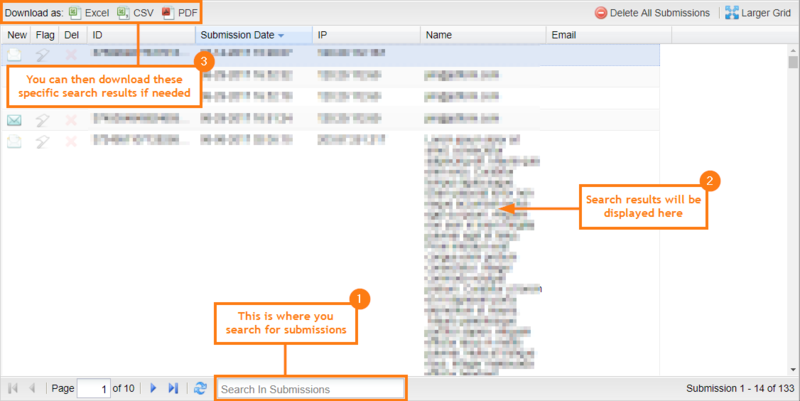 There, you will see the Search in Submissions bar where you can type in your search query. Comments and suggestions are welcome below. If you have a question, post it in our Support Forum so we can assist you. Hi, also having a problem with search, it's not finding any record for names that I know exist in the list. Does search work for forms with encryption? HI, My "Search in Submissions" has stopped working? I am typing in the surname of several people I know have a submission in the system and it is displaying nothing for each of them. Is this due to the change in year? is there a date setting I need to change? It says to check Time Frame. Where do I find this? Form deleted after 100MB of upload ? How do fix my account - currently disabled?